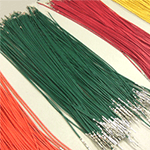 Elecmec offers comprehensive cable and wiring assembly, manufacturing and testing services; from single wire cutting, cutting and termination to complete harness assembly we undertake a wide variety of wire processing and cable assembly. Our fully automatic wire cutting and terminating equipment provides cost effective processing of small and large volumes. We ensure that all terminations are monitored for consistent quality using crimp force analysis technology, crimp height and pull testing. Electrical testing can be carried out to ensure 100% continuity and correct configuration / pin out.